101 The requirements below are applicable to linepipe consisting of a C-Mn steel backing material with a thinner internal CRA layer. 102 Linepipe is denoted 'clad' if the bond between the backing material and internal CRA layer is metallurgical, and 'lined' if the bond is mechanical. 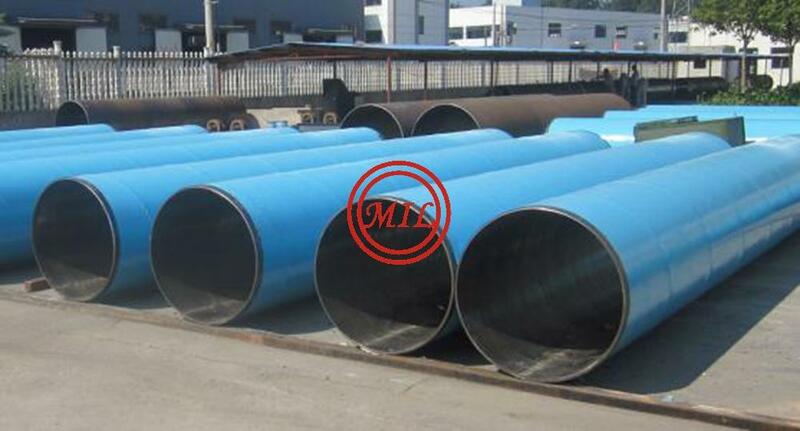 103 The backing steel of lined pipe shall fulfil the requirements in Subsection B. 104 The manufacturing process for clad or lined linepipe shall be according to A303 to A305. 105 Cladding and liner materials shall be specified according to recognised standards. If a recognised standard is not available, a specification shall be prepared that defines chemical composition. If agreed corrosion testing and acceptance criteria shall be specified. — UNS number for the cladding material or liner pipe. e.g. 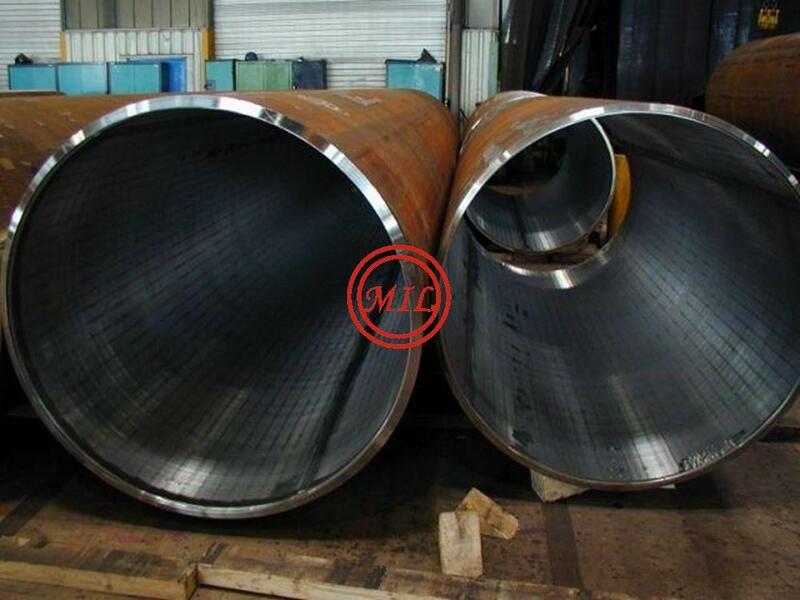 "DNV SAWL 415 D C - UNS XXXXX" designates a longitudinal submerged arc welded pipe, with SMYS 415 MPa, meeting the supplementary requirements for dimensions, clad with a UNS designated material. — details regarding any CRA clad welding to pipe ends. 401 During all stages of manufacturing, contamination of CRA with carbon steel shall be avoided. Direct contact of the CRA layer with carbon steel handling equipment (e.g. hooks, belts, rolls, etc.) is prohibited. Direct contact may be allowed providing subsequent pickling is performed. 402 All work shall be undertaken in clean areas and controlled environment to avoid contamination and condensation. 404 The welding consumables for seam welds and liner seal welds shall be selected taking into consideration the reduction of alloying elements by dilution of iron from the base material. The corrosion properties of the weld consumable shall be equal to or superior to the clad or liner material. 405 The cladding alloy shall be produced from plate, and shall be supplied in a solution or soft annealed condition, as applicable. 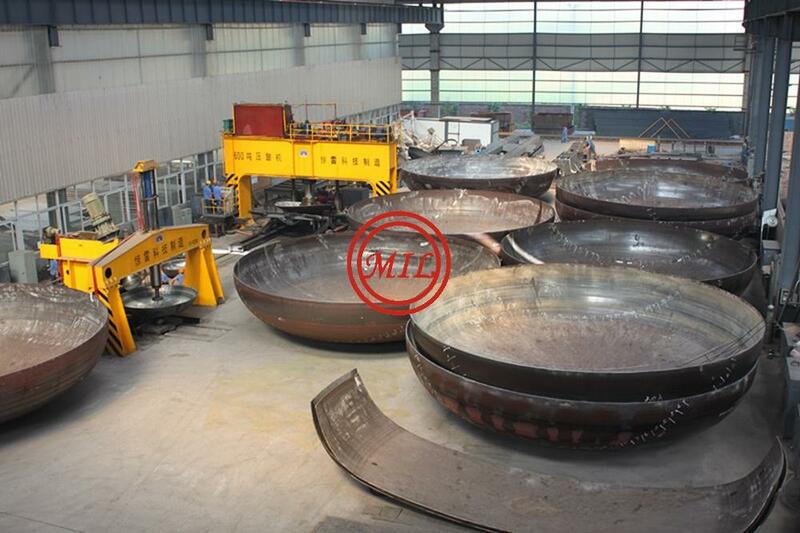 406 The steel backing material and the cladding alloy shall be cleaned, dried and inspected to ensure that the level of humidity and particles between the respective plates are equal to or less than for the MPQT plates. 407 Unless otherwise agreed, the mating plate surfaces shall as a minimum be blast cleaned to a surface cleanliness of ISO 8501 Sa2. 408 A pre-clad rolling assembly procedure shall be part of the MPS. This procedure shall include details of all surface preparation to be performed just prior to the sandwich assembly (if applicable). 409 The sandwich or one-side-open packages, as applicable, shall be hot rolled in order to ensure metallurgical bonding between the base and the cladding material. 410 The package consisting of sandwich or one-side-open, shall be manufactured through a TMCP route, or receive a final heat treatment (e.g. quench and tempering). — weld seam tracking of continuous welding shall be automatically controlled. 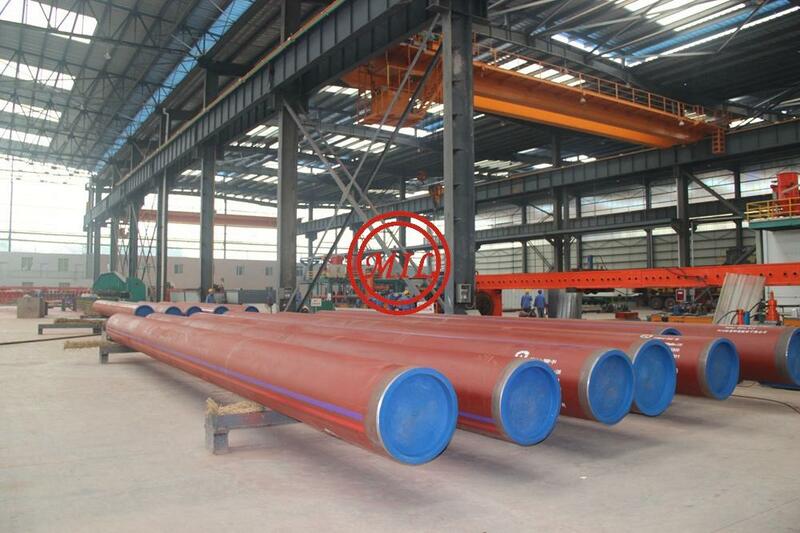 412 The liner pipe shall be manufactured according to API 5LC. 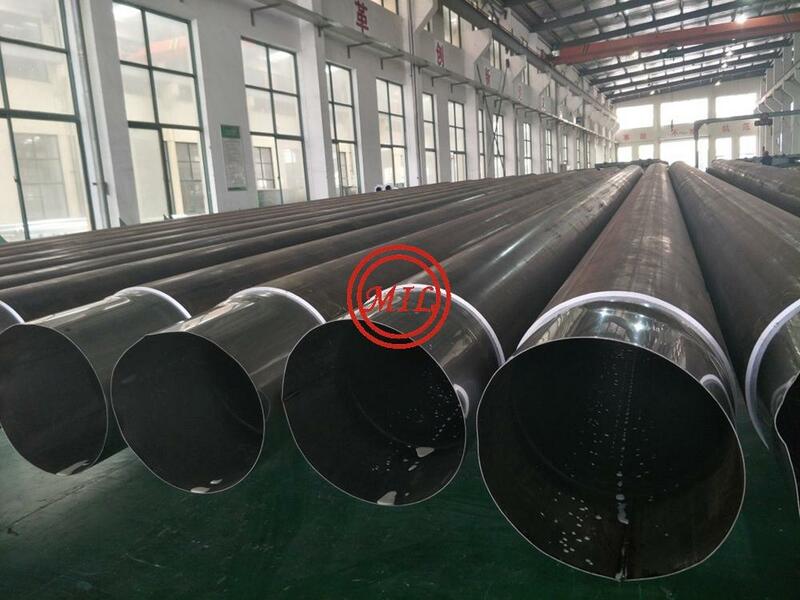 413 The internal surface of the C-Mn steel backing pipe shall be blast cleaned to a surface cleanliness of ISO 8501 Sa2 along the complete length of the pipe prior to fabrication of lined pipe. The external surface of the liner pipe shall be blast cleaned as specified above or pickled. 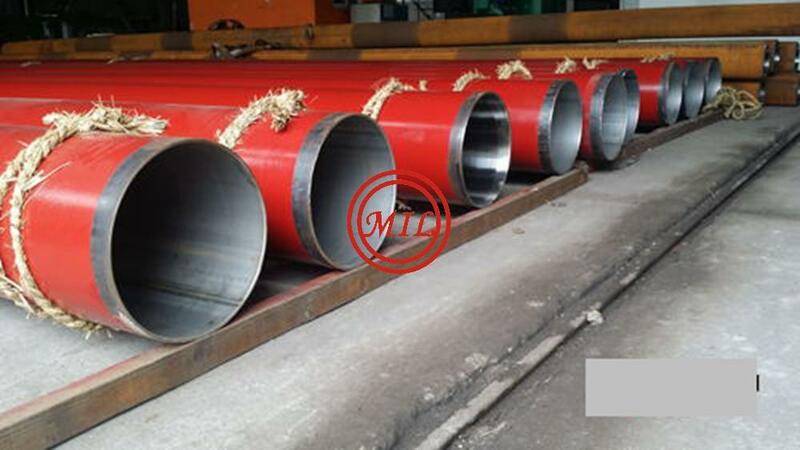 414 The liner pipe shall be inserted into the backing C-Mn steel pipe after both pipes have been carefully cleaned, dried and inspected to ensure that the level of humidity and particles in the annular space between these two pipes are equal to or less than for the MPQT pipes. 415 The humidity during assembly shall be less than 80%, and the carbon steel and CRA surfaces shall be maintained at least 5°C above the dewpoint temperature. Temperature and humidity shall continuously be measured and recorded. 416 After having lined up the two pipes, the liner shall be expanded by a suitable method to ensure adequate gripping. 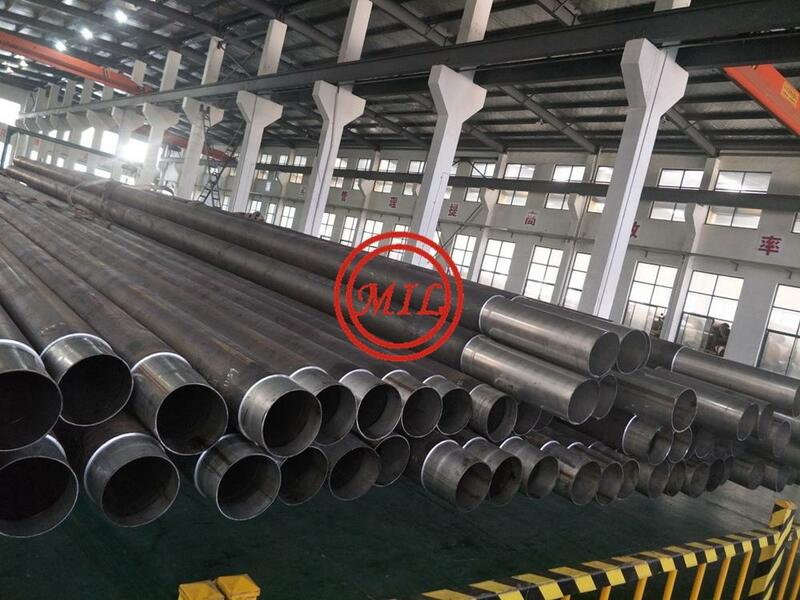 The carbon steel pipe shall not under any circumstances receive a sizing ratio, sr , exceeding 0.015 during the expansion process (See B332). 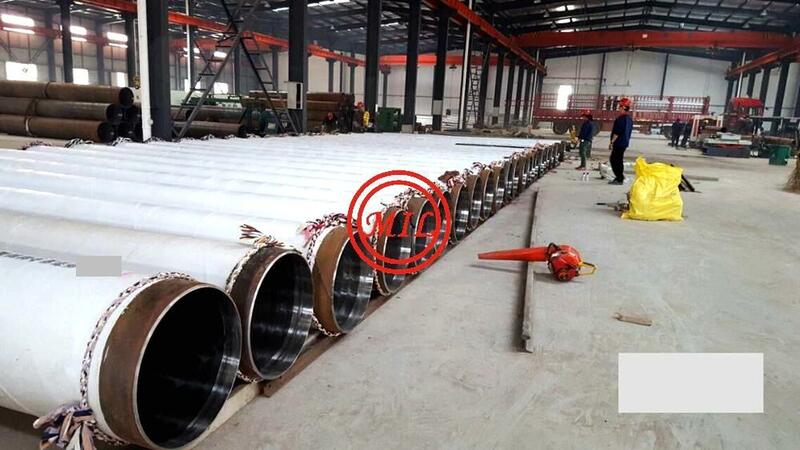 417 The liner pipe shall be welded according to API 5LC. 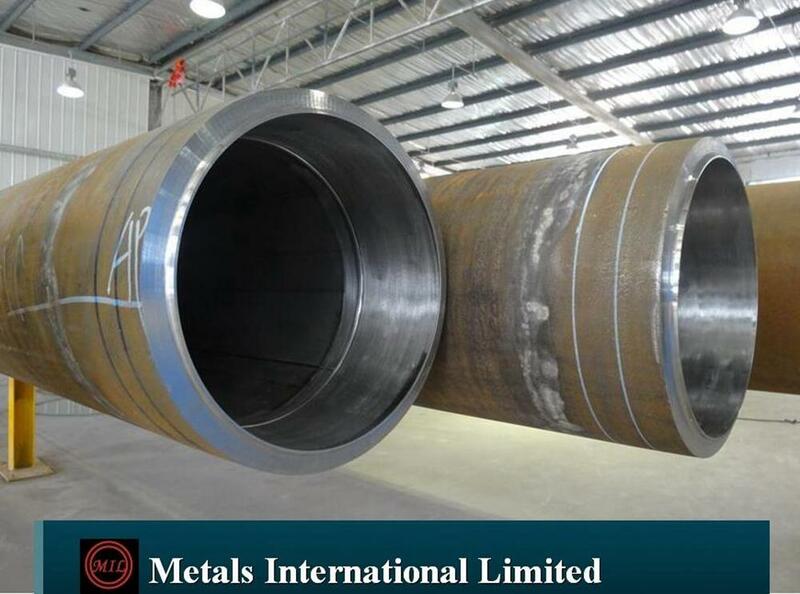 418 Subsequent to expansion, the liner or backing pipe shall be machined at each end and further fixed to the backing pipe by a seal weld (clad or fillet weld, respectively) to ensure that no humidity can enter the annulus during storage, transportation and preparation for installation. — the weld shall be purged with welding grade inert gas and be free from high temperature oxides. 501 The backing material of the manufactured clad or lined linepipe shall comply with the requirements for C-Mn steel given in Subsection B. Sour service requirements according to I100 shall not apply to the backing material unless required according to I115. 502 The cladding/liner material shall be removed from the test pieces prior to mechanical testing of the backing material. 503 The hardness of the base material, cladding material, HAZ, weld metal and the metallurgical bonded area shall meet the relevant requirements of this standard. 504 After bend testing in accordance with Appendix B A906 (see Table 7-14), there shall be no sign of cracking or separation on the edges of the specimens. 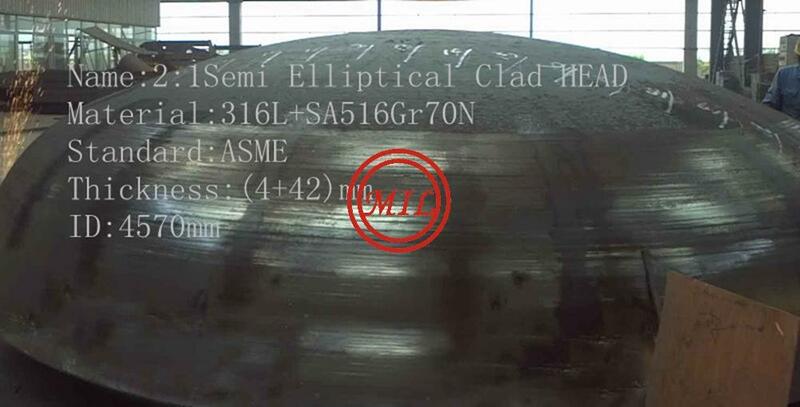 505 After longitudinal weld root bend testing in accordance with Appendix B A607 (see Table 7-15), the bend test specimen shall not show any open defects in any direction exceeding 3 mm. Minor ductile tears less than 6 mm, originating at the specimen edge may be disregarded if not associated with obvious defects. 506 The minimum shear strength shall be 140 MPa. 507 The CRA material shall meet the requirements of the relevant reference standard, e.g. API 5LD. 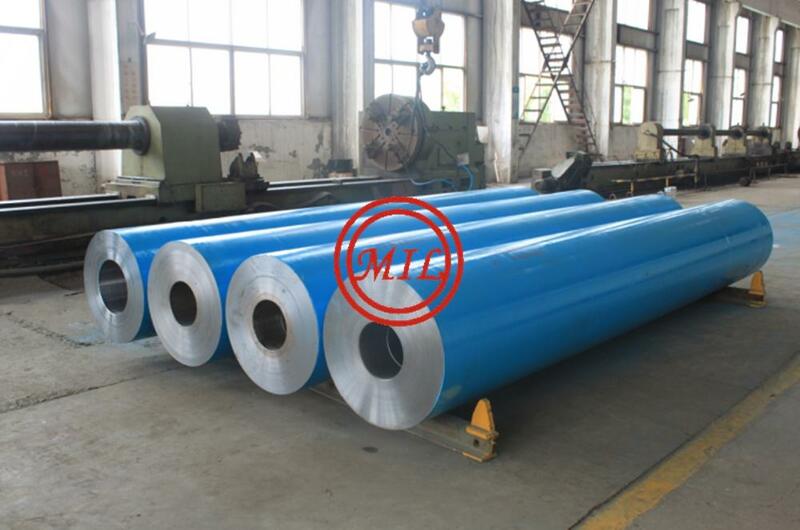 508 The chemical composition of the longitudinal seam weld of clad pipes, pipe end clad welds, and the liner seal welds (if exposed to the pipe fluid), shall be analysed during MPQT. Unless otherwise agreed the composition of the deposited weld metal as analysed on the exposed surface shall meet the requirements of the base material specification. Unless otherwise agreed the calculated PRE (see Table 7-10, note no. 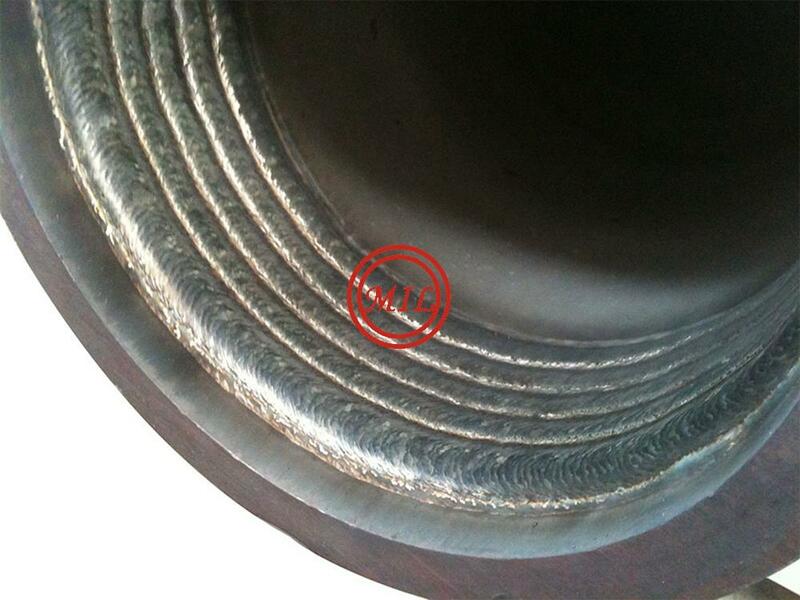 2) for alloy 625 weld metal shall not be less than for the clad pipe base material or liner material. 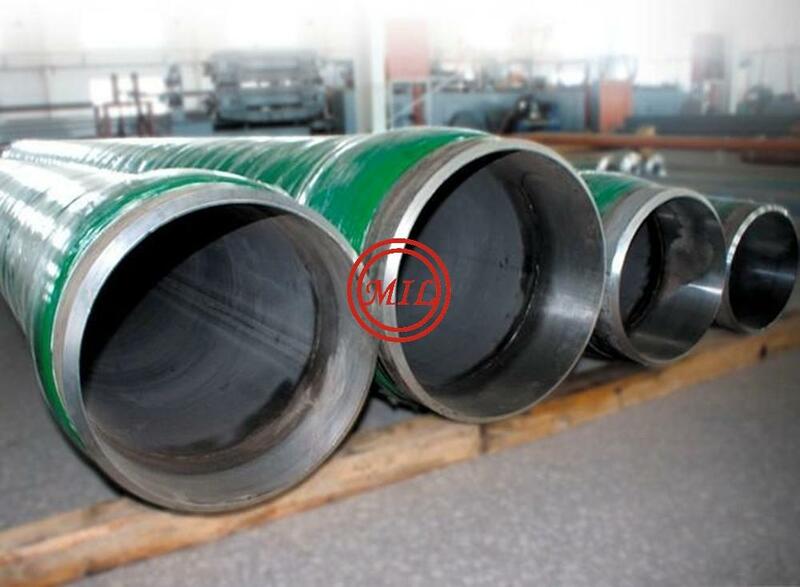 509 The weld metal and the HAZ in the root area of the clad pipe seam welds, any pipe end clad welds and the seal welds of lined pipe shall be essentially free from grain boundary carbides, nitrides and intermetallic phases. 510 Acceptance criteria for gripping force production testing shall be agreed based on project specific requirements (see Sec.6 B400) and/or test results obtained during MPQT. 511 After the test for presence of moisture in the annulus between the liner and the backing material, the pipe shall be inspected and no ripples or buckles in the liner or carbon steel pipe shall be in evidence when viewed with the naked eye. 601 Compliance with the requirements of the purchase order shall be checked by specific inspection in accordance with EN 10204. Records from the qualification of the MPS and other documentation shall be in accordance with the requirements in Sec.12. 602 The inspection frequency during production and MPQT shall be as given in Table 7-14 and Table 7-15, respectively. 604 For lined pipe, the number and orientation of the samples for the backing steel shall be according to Table 7-9. Testing of the liner pipe shall be according to API 5LC. 605 Requirements for retesting shall be according to B508 to B512. 606 Heat and product analysis shall be performed in accordance with B500 and C500 for the backing steel and the CRA liner or cladding, respectively. 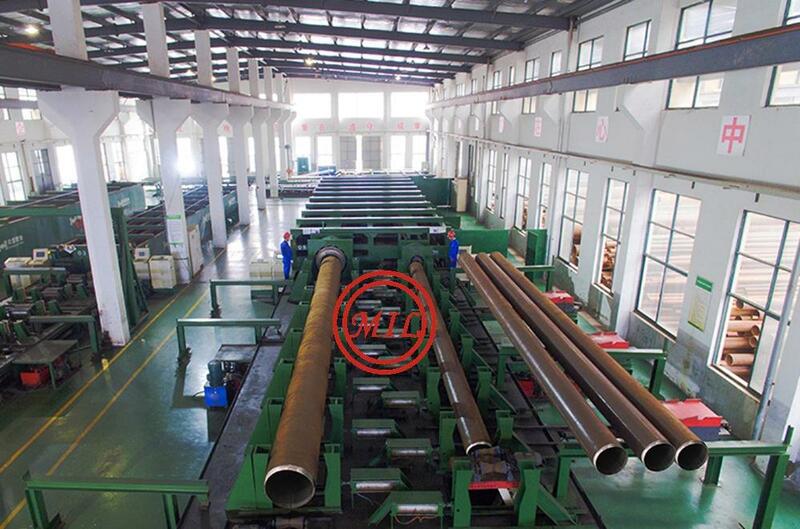 607 All mechanical testing of clad pipe and the backing steel of lined pipe shall be performed according to Appendix B. Mechanical testing of the liner pipe shall be according to API 5LC. 608 Hardness testing of welded linepipe shall be performed on a test piece comprising the full cross section of the weld. Indentations shall be made in the base material, cladding material and the metallurgical bonded area as detailed in Appendix B. 609 Unless otherwise agreed, corrosion testing of roll bonded clad pipes or any longitudinal weld seams is not required. 610 Macro examination and metallographic examination shall be performed in accordance with Appendix B. 611 To check for the presence of moisture in the annulus between the liner and the backing material, one finished pipe or a section thereof (minimum length of 6 m) shall be heated to 200°C for 15 minutes and air cooled. This pipe shall be within the first 10 pipes produced. 612 Gripping force of lined pipe shall be measured in accordance with API 5LD. Equivalent tests may be applied subject to agreement. Inspection frequency for production testing shall be agreed based on test results obtained during the MPQT (see D300). 613 Hydrostatic testing shall be performed in accordance with Subsection E.
614 NDT, including visual inspection, shall be in accordance with Subsection F.
615 Dimensional testing shall be performed according to Subsection G.
616 Surface imperfections and defects shall be treated according to Appendix D, H300. Clad pipe All tests in Table 7-7 applicable to "SAWL"
Sampling of specimens and test execution shall be performed in accordance with Appendix B. The number, orientation and location of test pieces per sample for mechanical tests shall be according to D603-604. As applicable, according to D508 and D509. A large number of material combinations are possible for the composite Overlay/Clad materials, as listed below, produced either by weld overlay or from clad plates. Pipes, Fittings, Flanges, Nozzles, Pressure Vessels, Heat Exchanger components are produced following the requirements of ASME/ ANSI/ ASTM/ API/ NACE and other specifications using established procedures for manufacture, with fabrication into pipe spools or pressure vessels performed per ASME/ANSI Code B31.1 and B31.3, ASME Section VIII, Division 1, customer drawings and specifications to provide a turnkey supply. Specifications︰ What is cladding overlay? Cladding overlay is a welding process that metal with high performance of anti corrosion, wear resistance property is cladded on the base metal. A classic example is to clad stainless steel or Nickel based alloy on the carbon steel which shall be anti corrosion while cost reduces significantly comparing to pure stainless steel or Nickel based alloy. Manifold, Pipeline, Bends, Bulkhead, Flanges, Valves & Blocks for Submarine X'mas trees. Risers, Bends, Elbows for Offshore Platforms. Pipe Fittings, Flanges, Insulation Couplings for Onshore Gathering, Stations, Treatment Plant, Desulfurization and Decarbonization Device X-mas Trees. Valves for Gas Processing Plant and Offloading Stations. Branch Pipes, Parts, Flanges, Weldolet for Pressure Vessel. Valves for Anti-corrosive and Anti-abrasive Applications for Coal Oil Industries. Clad Pipes, Hot Induction Clad Bends. ASTM A53 B, A106 Gr. B, API 5L B, X42, X52, X56, X60, X65,X70; ASTM A333 GR.6, GR.3 Stainless Steel. Thickness of Base Pipes: 6mm~ 75mm. OD of Pipes: DN125 ~ DN600 (130mm~600mm). Length of Pipes: Up to 12.2m. Process of Bending: Hot Induction Bending and Cold Bending. Bend Radius: 3D~ 10D or on customer's request. Bend Angles: For Cold Bending 1°~ 180°/ For Hot Induction : 1°-100°. Diameter of Clad Bends: 4"~ 20". 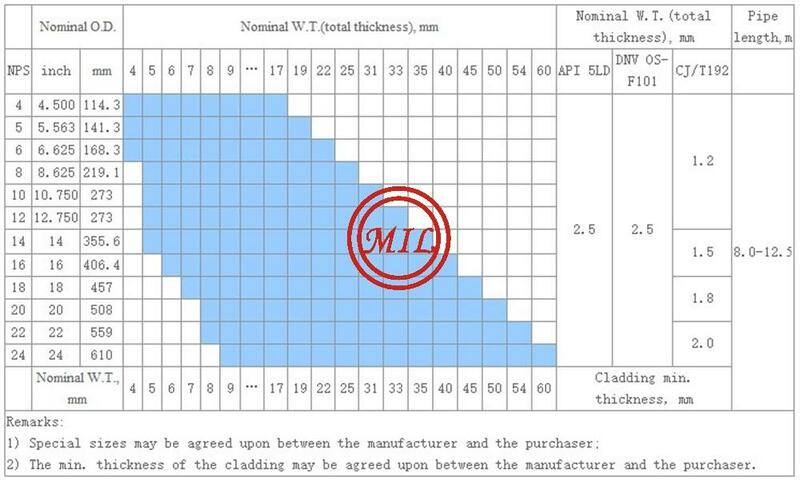 Wall Thickness of Clad Bends: STD~75mm. Clad Flanges, Clad Fittings and Clad Service. Base Material of Valves: ASTM A216 WCB, WCC; A352 LCC. ASTM A105/A105N, ASTM A350 LF2 CL2, LF6 CL2. ASTM A694 F42, F52, F60, F65, F70. AISI 4130 (M), 4140, 4340, 8630(M). ASTM A234 Grade WPB, WPC, WP11, WP22. ASTM A860 WPHY52, WPHY60, WPHY65, WPHY70. ASTM A516 GR. 60/GR. 70. Stainless Steel 304 /304L 316/316L, 317L, 347, 904L, 410. Inconel® 600 /625 Incoloy® 800 /825. 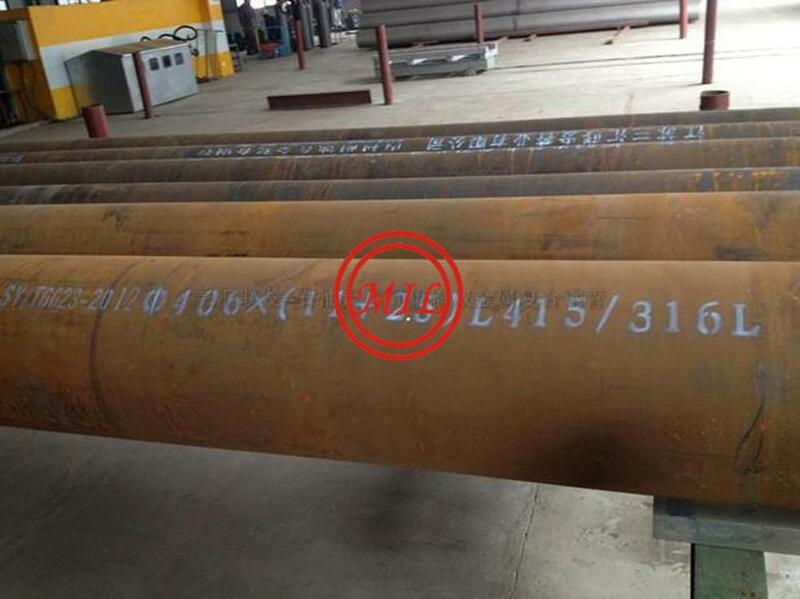 Duplex Steel S31803, 2205, S32760, 2507, 2209. Positive Material Identification – PMI. The clad pipe includes an external layer and a coating layer made of Ni base anticorrosion alloy. Both end portion areas of the coating layer are formed by a build-up welded layer (Ni base alloy of composition 1) on the inner surface of the external layer. Other areas are formed by a Ni base alloy layer (Ni base alloy of composition 2) fusion-bonded to the build-up welded layers and the inner surface of the pipe, a solidus-curve temperature of the Ni base alloy layer being 1300° C. or below and lower than a solidus-curve temperature of the Ni base alloy formed by build-up welding by 150° C. or more. Composition 1 and composition 2 are adjusted so that, in the same environment, corrosion resistance of the Ni base alloy of composition 1 is equivalent to or superior to that of the Ni base alloy of composition 2. Nondestructive tests (NDTs) are performed in compliance with API 6A, API 5LD, and DNV OS F101 standards, or as otherwise specified by the client. The Clad/Lined Pipe can be equally allocated the pressure to outer pipe and the corrosion-resisting to inner pipe. The material combinations dramatically reduce the cost of raw materials, and the average cost is just 1/6~1/3 of CRA. Furthermore, the cost effectiveness increases as the length of the pipeline increases due to reduced installation and welding expenses. The Clad/Lined Pipe, selecting more suitable CRA material as its inner pipe based on the corrosion environment, totally owns the corrosion-resisting property of CRA. Comparing with inhibiter, this solution avoids the risk caused by the complicated management process and guarantees the operating safety. Underwater deflagrating and cladding technology is the instant forming technique that makes the inner pipe be telescopically aligned inside the outer pipe through internal expansion of detonation wave, and it results in a tighter bond between the two pipes. This technology keeps the stability of physical and chemical properties for outer and inner pipes during the cladding process. Corrosive Resistant Lining: Clad Pipe - Clad Tubes - Clad Lined I.D. - Clad Surface O.D.explosion bonded tubes and pipes. With Explosion Bonding technology we manufactures explosion bonded clad tubes and pipe with a true "metallurgical bond". The clad metal surface can be explosion bonded to the I.D. or O.D. providing the most robust corrosion and erosion resistance for tubes and pipes. Explosive Bonded Clad Tubes and Explosive Bonded Clad Pipes now provide options for the design engineers focused on providing solutions for the most demanding opportunities in the chemical processing, energy / power, and petro-chemical Industries. 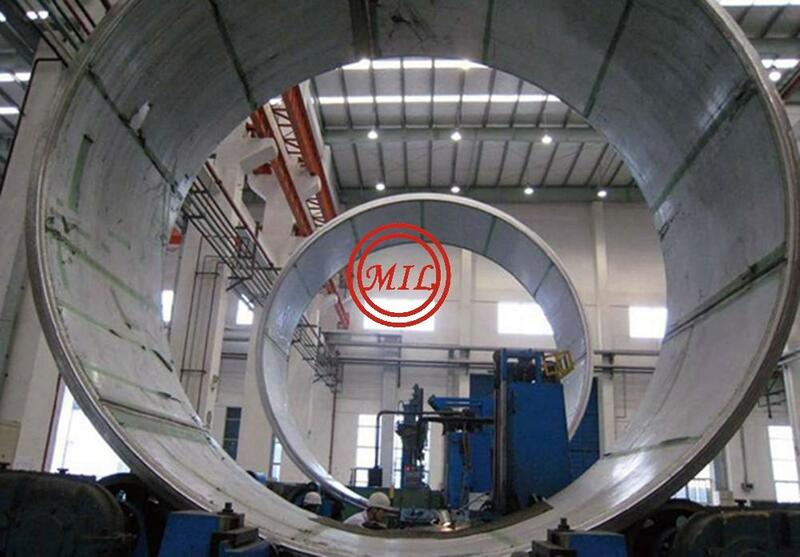 Another application of metallurgically bonded clad pipes made of roll-bonded clad plates are so-called catenary risers in the offshore industry. These vertical pipelines connect the subsea gas or oil field with the production facilities above sea level. Due to the high pressure of deep water installations and dynamic loads by waves and drifts as well as due to the corrosive medium inside such riser pipes must provide excellent mechanical properties as high strength combined with good toughness as well as proper corrosion protection. Base: Aço Carbono API 5L até X80 e Cr–Mo. Cladding: Aços Inoxidáveis (316L; 321; 347 e 904L), Ligas de Ni, Inconel (625; 825 e C276) e Alloy 59.